This paper focuses on miRNA analyses in Ectocarpus (esp) discussing the evolutionary background and considerations of the origin of miRNA loci for given lineages of organism. I found it interesting because it took systems with less established miRNA backgrounds and used a broad context for its mechanism and role. As brown alga are thought to have independently evolved multicellularity, which gives particular insight for the possible role of miRNAs in this process. Additionally, ectocarpus has a large suite of homologues known to be associated with miRNA function in plants and animals, making the origin and similarities of this mechanism interesting (Table 2). The outcome of this analysis resulted in 63 families with a total of 64 loci, most of which were new and even filtering out many loci from previous studies which failed to meet requisites. The clearly result of this is that nearly all miRNAs found within Ectocarpus have no other family members. Even when looking in only the seed region of a loci, the authors found that even low identity (>75%) cutoffs retained the vast majority of loci in separate families. 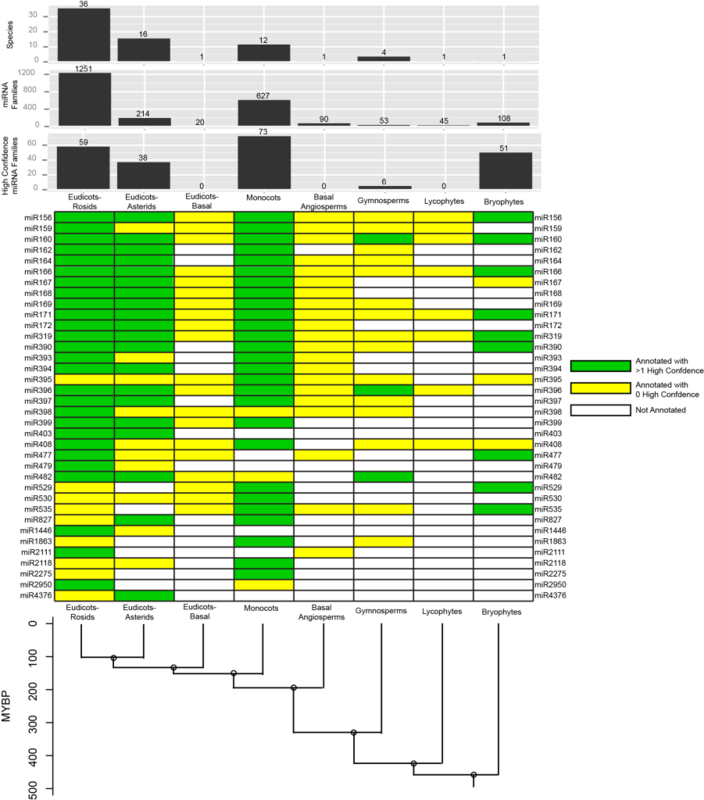 One of the hypotheses of the paper was to indicate that there would be expression specificity between male and female individuals, which was not supported via northern blot (Figure 1). In the prediction of targets for miRNAs, the authors implemented the tool TAPIR, looking for high-complementarity targets. This process yielded 160 targets, available in Table S3. Despite the lack of family expansion, apparently several of the miRNA are found to redundantly target the same genes. When looking at the evolutionary origins of esp-MIRs, the authors found some interesting results. According to the authors, miRNA loci-loss occurs very slowly, and usually in only exceptional cases. Is this true? A paper is cited that has a differing opinion, but is discounted as an “over-estimation”. To examine mirs in closely related species, they looked at two closely related alga, as well as two more distant diatoms. Despite the relationship, NO mir loci matches were found through blast search. Would we expect this? This means that this lineage has evolved its own set of miRNAs. As for multicellularity, the authors contend that the presence of miRNAs is associated with developmental complexity. They support this argument by saying that there is a correlation between number of cell types/ developmental characters and the complexity of miRNA systems in an organism. Just looking purely at the number of families, they show that higher order plants and animals have more while lower organisms have less. I’m not sure how convincing this is, as its highly speculative and doesn’t talk much about an evolutionary mechanism. 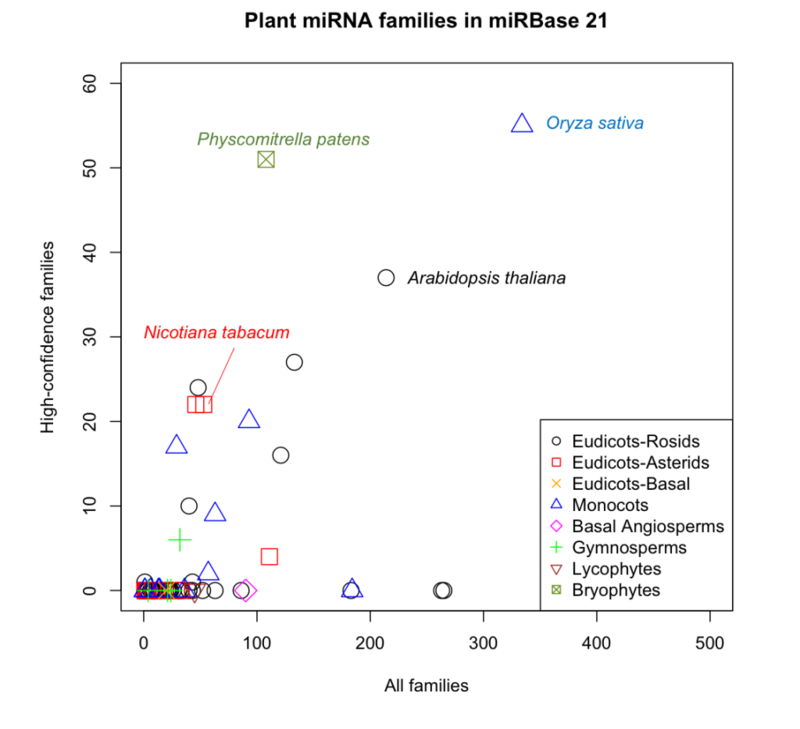 Mechanistically, esp-mirs seem to have commonalities with plant and animal miRNAs, having similar fold-backs to land-plants and 21-mers as the most common mature. The paper indicates that esp-AGO2 is 40% identical with HsAGO2, but they don’t speak to AtAGO2. Important differences include that there is a vastly higher ratio of mir:mir* in terms of read detection (>400 fold). If this is the case, it seems likely that the authors may be missing significant portions of miRNAs, considering the required depth for identifying a star sequence. Similar to our lab’s philosophy with shortstack (setting a very high bar for miR discovery), the authors seem to be concerned with false positives, striving for only including confirmed miRs, and even pleading for higher standards for mir identification in the field. Considering this, it seems interesting to me that they do not speak to a requirement for high expression levels for a mir, something that I thought was tacitly required, though we don’t implement this standard either. Mike suggested that I post some information on how and where to print fabric posters, like the one I made for ASPB this year. There is a great website providing information on this whole topic, written by Jessica Polka through the American Society of Cell Biologists. This article is extremely informative, and can easily walk you through the steps to printing your own. The cost for printing is comparable to, if not better than anywhere in town. About $25 for their slow service which takes about 2 weeks and about $45 for a rush order (around 3 days to turn-around). Quality is excellent! As good as any poster you’ve seen. If you don’t believe me, come look at mine. The only drawback is some size restrictions… The quoted price can print a poster that is 36″x 58″, which is fine, but to make it larger would cost more.